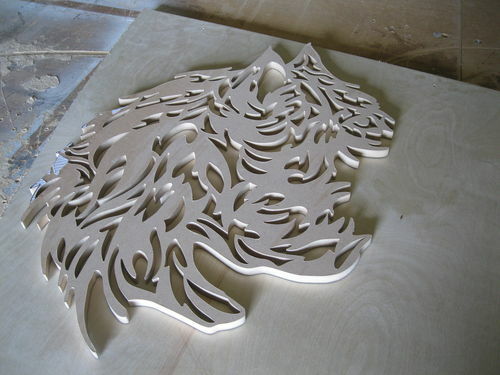 On my posts I show large scale work and I mention templates to cut cutting templates to cut on a pin router. I realize some of you might not know what all that means so, I decided to do this blog to show you what has to happen to create a large scale wall art. 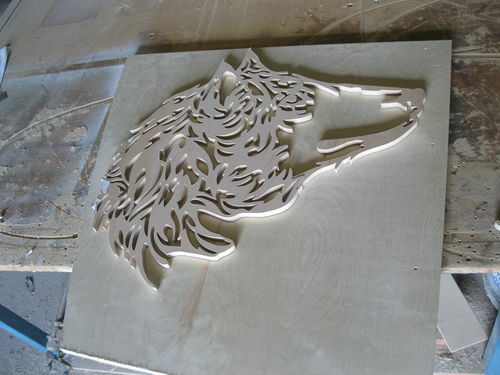 It would be nice to just cut it out on the scroll saw but I am limited to 26” on my RBI. You all know what that’s like. 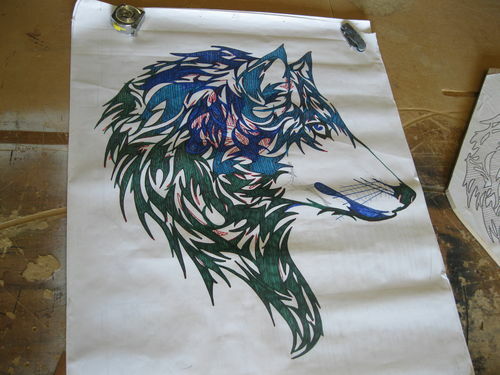 So I draw the piece full scale and make changes as I go. You can see this in picture 1 where it has all the different marker colors. I start with the lighter colors, as I make changes the colors get darker to overpower the color below it. When I am happy with it I get a fresh piece of paper and trace it with a light gray sharpie then I use a black sharpie on all the borders as shown in picture 2. Then I glue it to the material I am using for a template (anything 1/4” to 1/2” that is big enough for the design ) in this case 1/2” MDF. 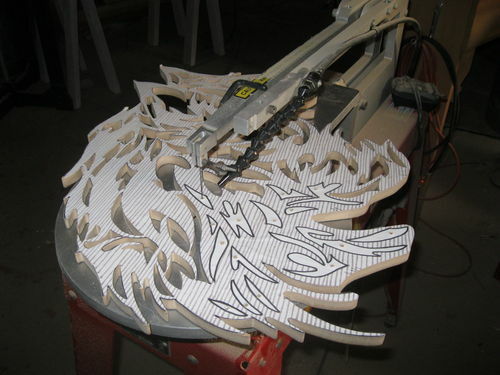 Working in a custom production shop I have access to a lot of different scrap materials ( perk ). 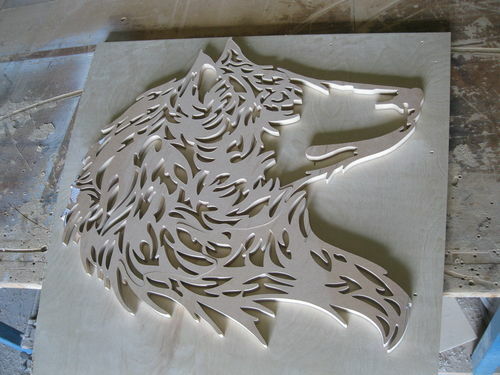 The template is cut into smaller pieces so they fit on the scroll saw. Using a zig-zag method so all the parts go back together in the correct place. Then I start cutting out all the pieces on each part pictures 3 – 6. 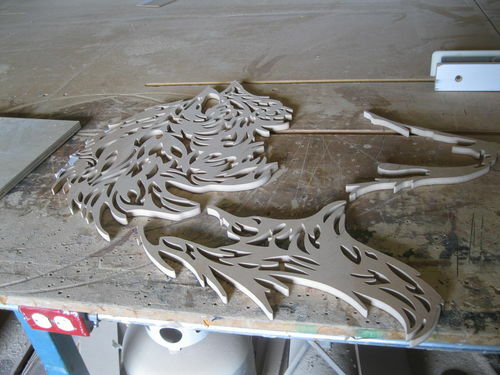 Once the parts are all cut out on the scroll saw I peel off all the paper template. 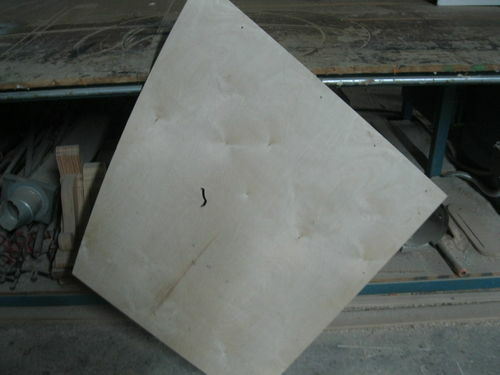 Trick so the paper template will come off the wood: when using spray adhesive, spray the paper not the wood, let it tack and apply it to the wood. Do not spray the wood. After the paper is removed it looks like picture7. I then put all the parts together for review. Pictures 8-10. 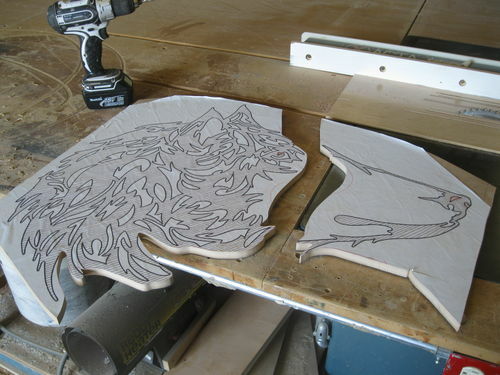 Now it’s time to attach the parts to a piece of 3/4” plywood to make a cutting template for the inverted pin router. 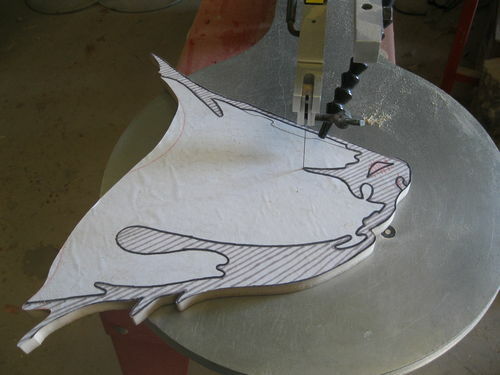 I place the 1/2” scroll saw template on the 3/4” plywood making sure to leave 1” of material all around the design because on the pin router my first cut I will be using a 1/4” bit with a 1/4” pin this will get the bulk of what I am cutting. My second cut I will be using a 5mm bit with a 5mm pin. I do this because the 1/4” bit will leave a 1/4” radius on all the inside corners and it doesn’t look good. That’s why I go back with a 5mm bit to get a tighter radius, it looks better. 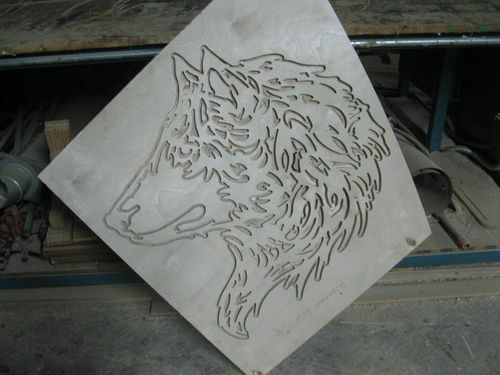 I am going to skip over the pin router for now and go to what the cutting template looks like when it is done, then I will go back to explain the inverted pin router because you will understand it better. 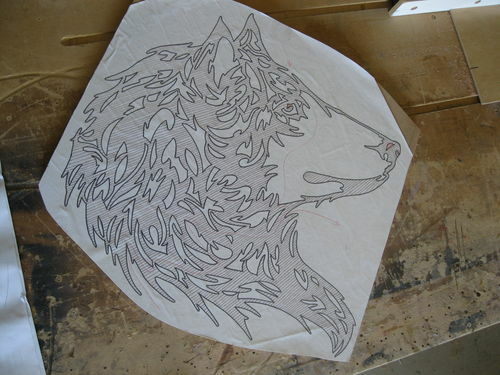 In picture 11 it shows you what the finished cutting template looks like. In picture 12 it show a close up of how I am cutting it. To make a pin router cutting template I am cutting it 3/8” deep ( half the thickness of the material ) this groove is going to be the path for the pin to travel in. 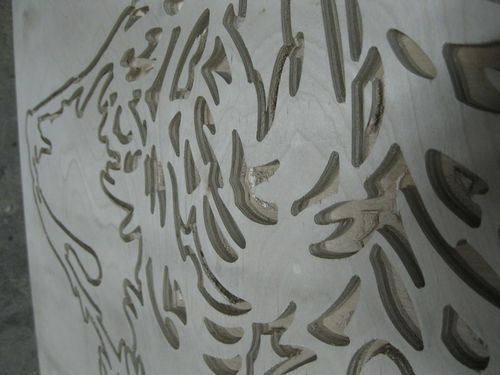 Picture 13 shows the back of the cutting template. Pay no attention to that grove in the middle there ( A SCREW UP ) Hay everyone makes mistakes. The pin router has a lever where you can adjust for three different depths of cut and I hit the leaver. Here is a good video to explain the inverted pin router. This project is a work in progress I will add more as I go. If you guys have any questions so far please feel free to ask. 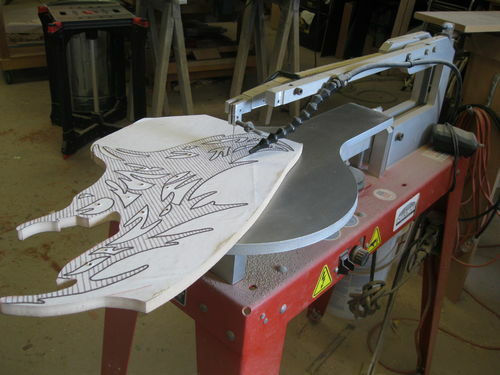 I hope this helps you understand how I use a scroll saw with a pin router. Here is a mini version of the inverted pin router for garage woodworking use.